A Four-Point Inspection is typically performed for a homeowner when it is requested by their insurance company to obtain a new insurance policy or renewing an existing policy. A Four-Point Inspection is far less in scope than a Full Home Inspection. It is a limited, visual examination of the heating/cooling, roof, electrical and plumbing systems. S.I.M Home Inspections will help the homeowner know which areas that need to be rectified in order to successfully obtain the insurance coverage. 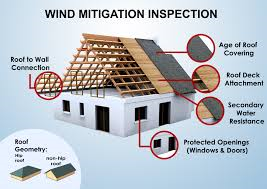 Wind Mitigation Inspection is a kind of home inspection commonly performed in the coastal areas of the Southeastern United States. The purpose of a windstorm inspection is to determine the appropriateness of a given structure's construction in the event of strong winds. At S.I.M Home Inspections we look for construction features that reduce losses in hurricanes, such as a hip roof, concrete block construction, the presence of gable end bracing, shutters and opening protections.